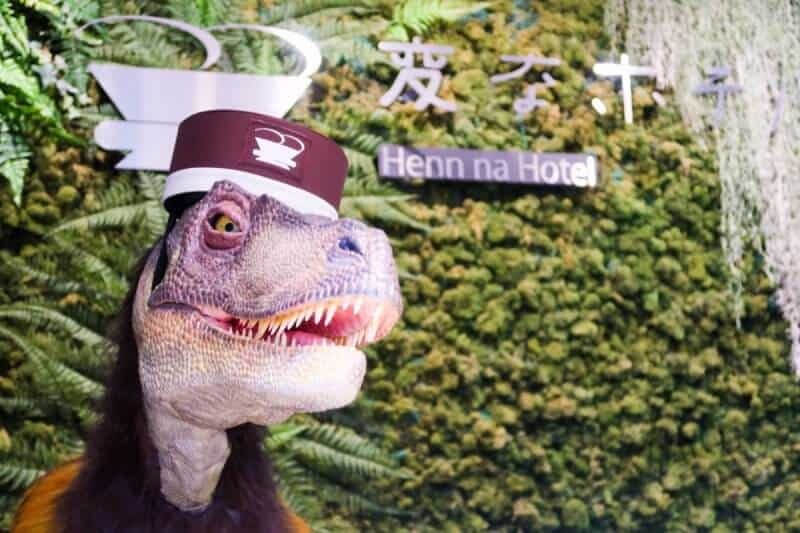 The Henn na Hotel Maihama Tokyo Bay is the second hotel of its kind in Japan where some of its operations are automated by robots. 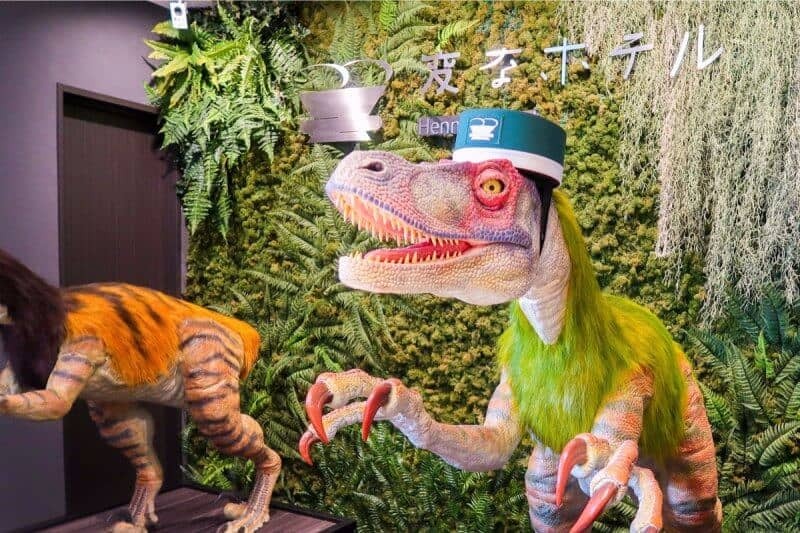 At the reception desk, you’ll find two multilingual velociraptor robots. 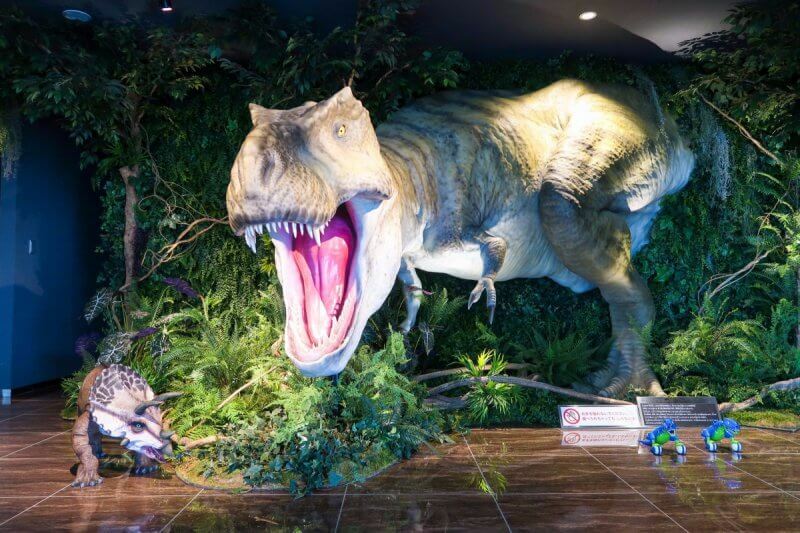 The lobby is home to a few other prehistoric animatronics, and the rooms are equipped with a robotic assistant. 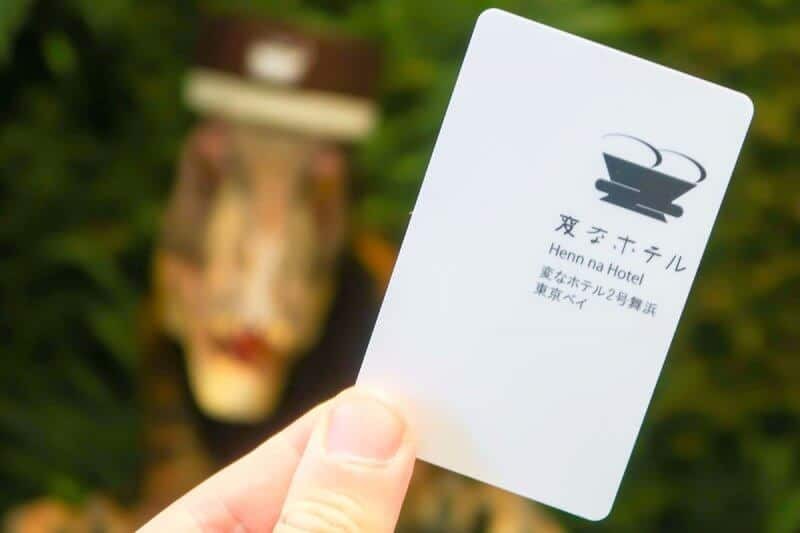 “Henn na” in Japanese means “strange,” which is the perfect description of this hotel. Intrigued yet? 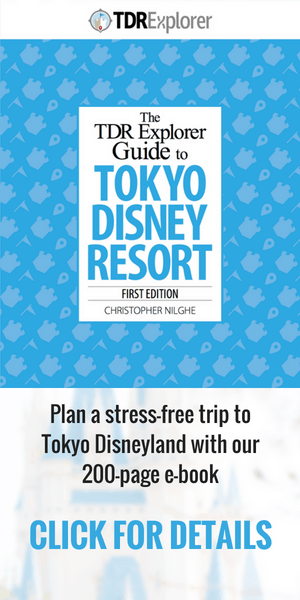 Here’s my review of a truly unique hotel found only in Japan near Tokyo Disney Resort. 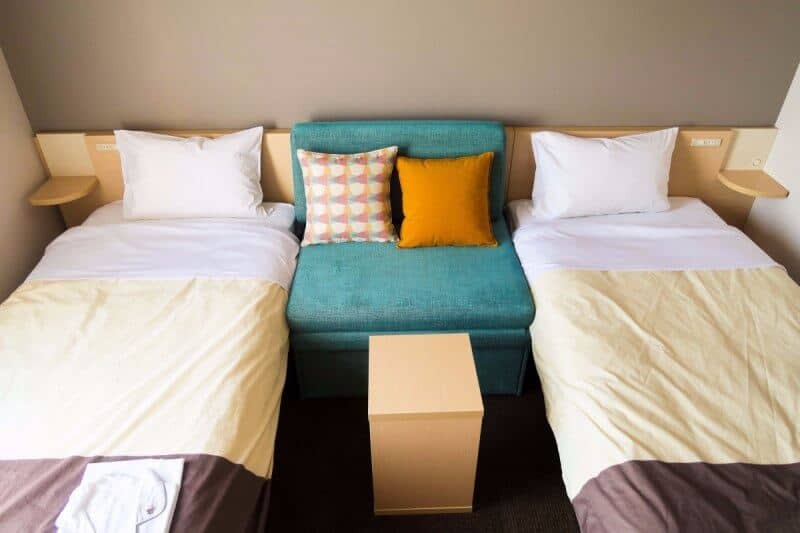 Rooms start at around ¥11,000 ($100USD) per night for a standard room for two people. Our room was the standard room, which we booked on the official website. I also recommend checking Booking.com to see if you’re able to get a better rate. The hotel is about a 20-25 minute walk from Maihama Station, which is less than ideal. 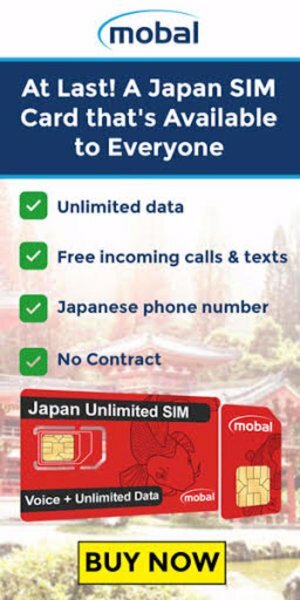 You can take a taxi, which costs you about ¥1,100 ($10USD). Another cheaper option is the local bus, which leaves right from Maihama Station and costs ¥145 per ride. The bus does give change, so you don’t need to be exact. The easiest way to pay is to use your Suica IC Card (read about that here). The most alluring aspect of the hotel is the lobby. 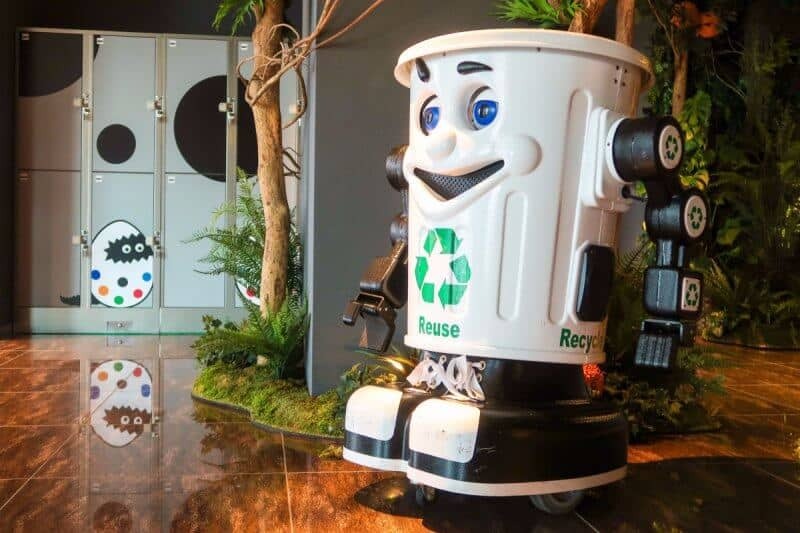 When you walk into the lobby, you’re greeted by an animatronic T-Rex and a tiny robot recycle bin. 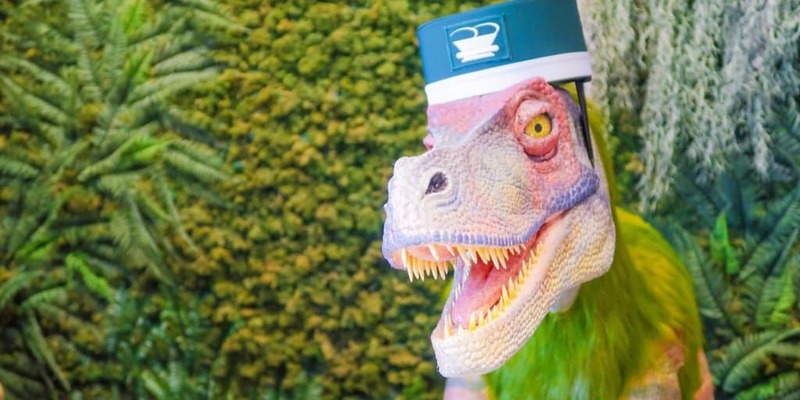 Then to your left are two velociraptors in bellhop outfits manning the reception desk. At first, it’s a bit unsettling and perhaps unnerving. Once the confusion wears off, it’s time to check-in to your room. You do this by walking up to the moving velociraptor. 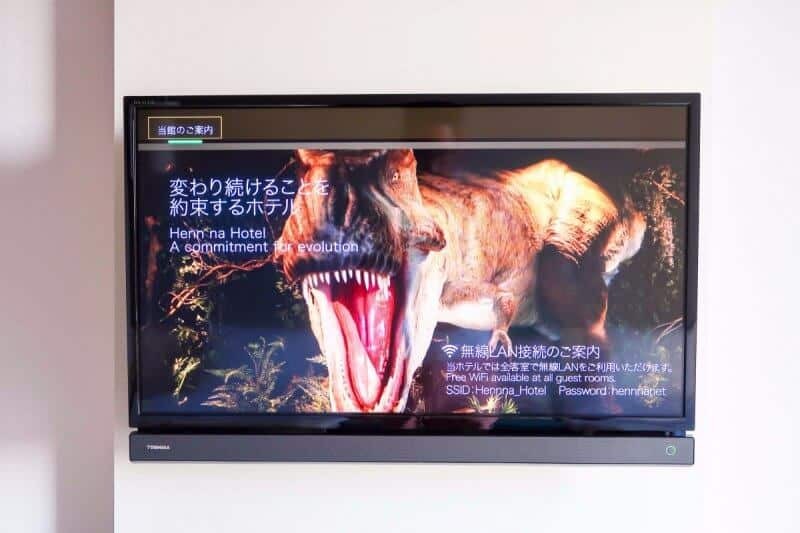 Select your language on the screen on the counter and follow the prompts, thus beginning your journey with the Henn na Hotel. When we did this, it did not work properly and the poor velociraptor had to call their human assistants to come and finish checking us in. This meant the process wasn’t the smoothest. Other than the technical problems (which I hope they figure out at some point), the check-in process isn’t too complicated once another human being is there to help. 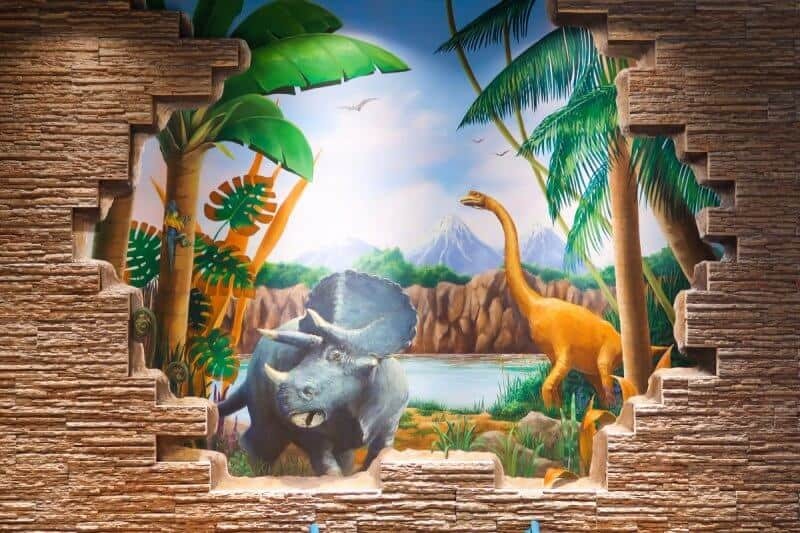 Despite the technical issues, it’s something else to have two extinct creatures speak to you in English and ask for your passport. It’s not an experience I ever thought of checking off the ol’ bucket list, but here we are. I did play with the language buttons afterward to hear them speak Chinese (Mandarin), Korean, and of course, Japanese because I am strange like that. Once you have your room keys and head to the elevator, take note of the coffee and hot food vending machines (there’s a normal drink vending machine on the opposite end of the lobby). The hotel has done everything they could to have you avoid contact with any type of human being. Before you jump into the elevator, take note of the large fish tank stocked with robotic fish. My only complaint is there should have been Chris Pratt (or even a lookalike) in the lobby to help me with my bags. The room we stayed in was their Standard Room (the cheapest). It was clean, modern, but a little cramped. Since the hotel is relatively new, everything was in pristine condition. 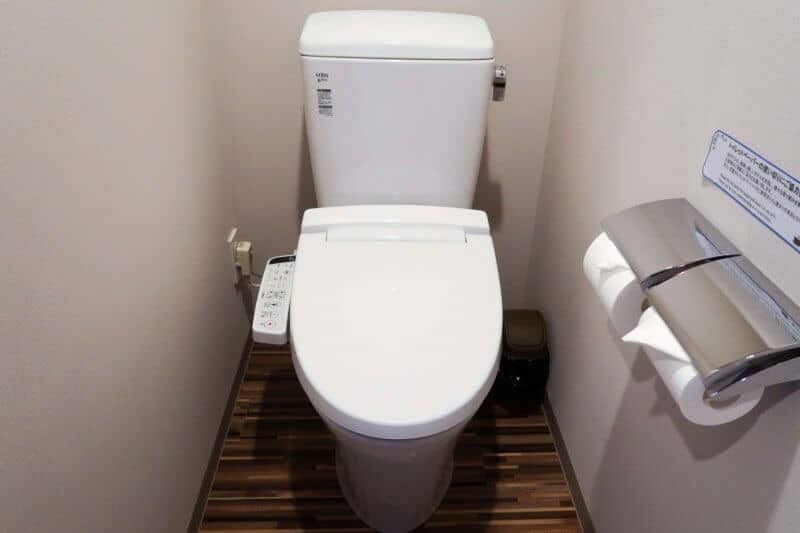 It’s a standard Japanese hotel room, which translates to a bit on the small side, featuring a Japanese shower room and toilet, and firmer beds. The room was 18m2 (194 square feet) and may feel cramped for some. If you have a lot of luggage, you may struggle to find space for it all. Paid lockers are in the lobby, however, if you need them. The shower and toilet are in separate rooms (standard for Japanese hotels). The beds and pillows are on the firm side, which may or may not bother you. I prefer a firmer bed and these bordered on almost too firm. The pillows have beans inside them on the underside, too. The view from the room is nothing to get excited over. 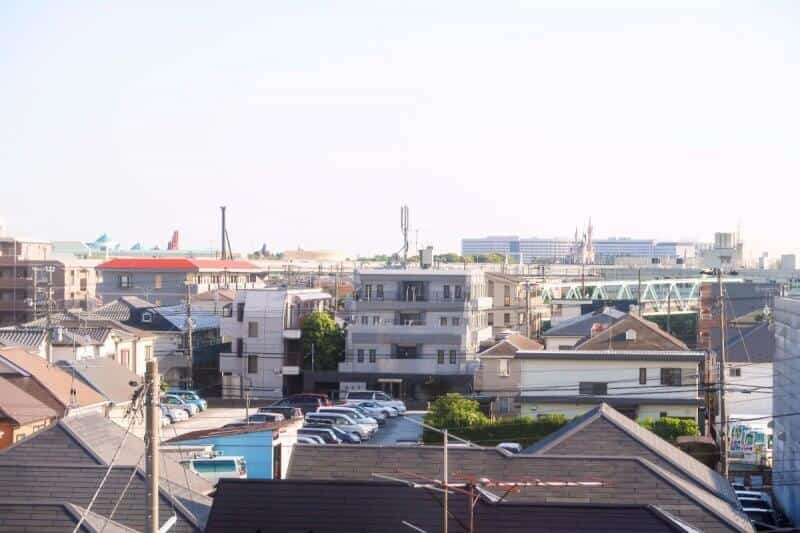 You’ll see Tokyo Disney Resort in the distance, but you’re surrounded by apartment buildings and houses. Since this is a residential area, this doesn’t come as a surprise. 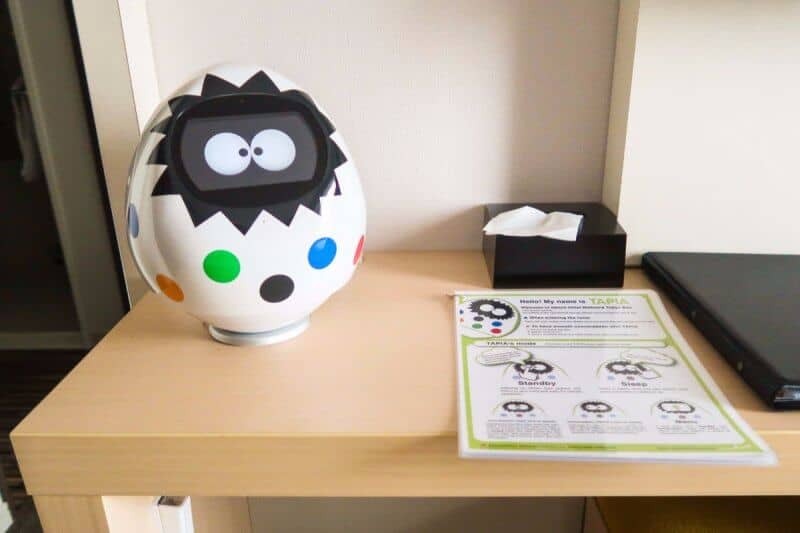 The room comes with a little robot companion that’s supposed to make your life easier. Let’s just say that it was far from easy. It listens to voice commands and does a number of things such as use the TV, adjust the heat or air conditioner, etc. Ours was only in Japanese and I wasn’t able to figure out how to switch it to English (it’s supposed to). I could have phoned a human and had them take a look, but I couldn’t be bothered. Instead, I fumbled around with it and gave it commands in Japanese. The most I could muster from it was the weather. 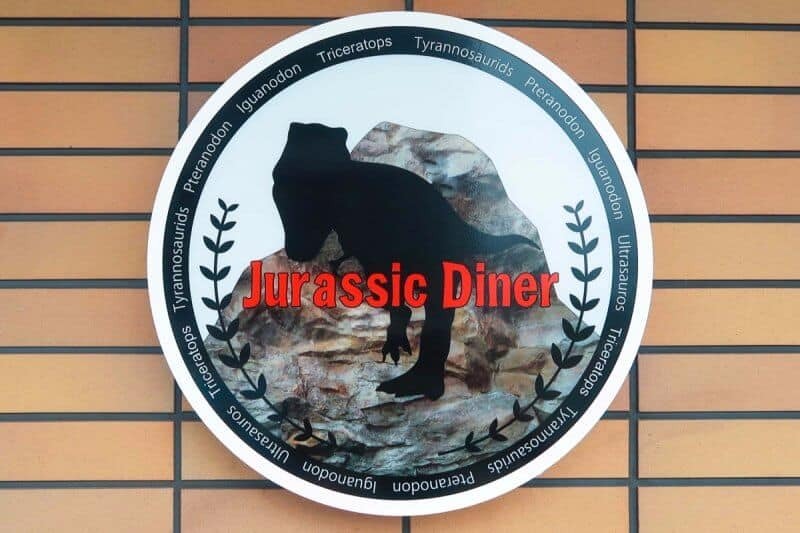 It’s cute and novel, but a bit unnecessary (you could argue the dinosaurs are unnecessary, too, but I digress). 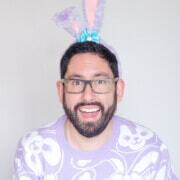 Words can only get you so far, so watch my full room tour to see for yourself. I even show you how to use the Japanese Washlet. Don’t worry: I just point and explain, I don’t actually give a demonstration. The hotel has excellent free wi-fi, which does require a password. You’ll find it on the TV (it has English) or on a pamphlet in your room. There’s a breakfast buffet just outside the main lobby. I was pleasantly surprised with the quality of the food. For ¥1,800 ($16USD) per person, there’s a huge variety of food. 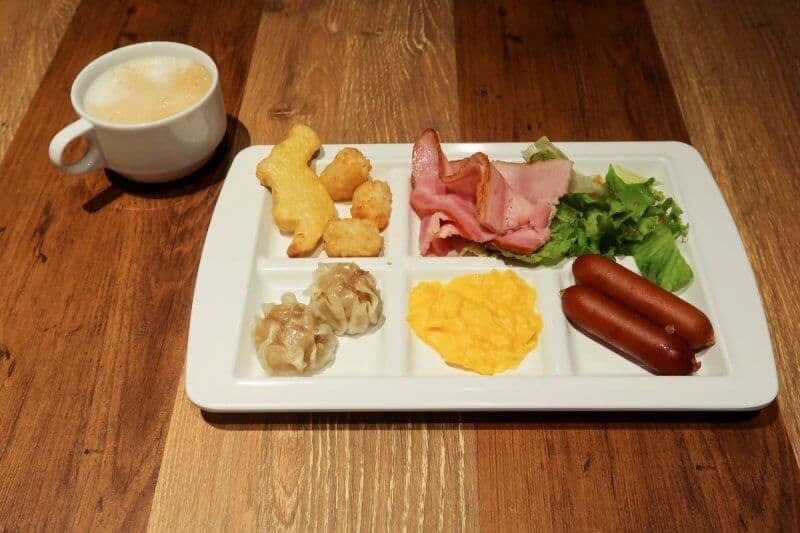 There’s Western and Japanese cuisine to choose from, which includes cereal, ice cream (who doesn’t love ice cream for breakfast), waffles, bacon, eggs, soup, etc. This is much cheaper than what you’ll get in terms of buffets at Tokyo Disney Resort (which start around ¥3,000 ($27USD) per person. We didn’t add this to our reservation when we made it, which was a bit problematic. I thought we’d be able to pay at the restaurant if we decided we wanted to eat there. This ended up being more complicated than it needed to be. Long story short, we were able to eat there but had to pay in cash because they wouldn’t accept credit card. If you plan on the breakfast buffet, make sure to add it when you make your reservation to make things easier. You can skip the breakfast buffet and have a cheaper breakfast across the street at the Lawson convenience store (which is open 24 hours). What you receive as a hotel guest is minimal. You’ll get the standard toothbrush, toothpaste, shampoo, conditioner, body wash, and room slippers. There’s a lot to love about this hotel and some things that are less than stellar. The Henn na Maihama Tokyo Bay Hotel is clean, modern, and comfortable. The talking velociraptors, robot fishes, and talking robot in your room are an entertaining gimmick, but they quickly lose their novelty. 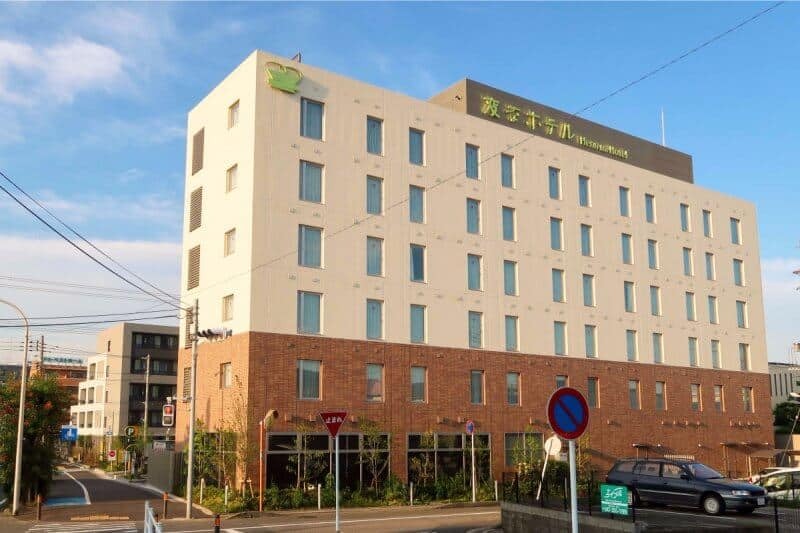 If you’re searching to add an “only in Japan” experience to your trip, then this hotel fits that description quite well. At the price point, it’s worth it for one or two nights. I wouldn’t recommend staying here for any longer because of the distance from Maihama Station.